Now we get to the fun stuff, or as we say on Wind Horse, “the play room.” If you are concerned with safety, ambiance, cost, and frustration, it starts and stops right here. Get the systems and drive line right and your cruising life will be most pleasurable. Get it wrong, well, that is why so many boats sit in marinas and boat yards, and why dreams often turn sour. Resisting the temptation to bury systems behind panels which may look clean but hide developing problems. 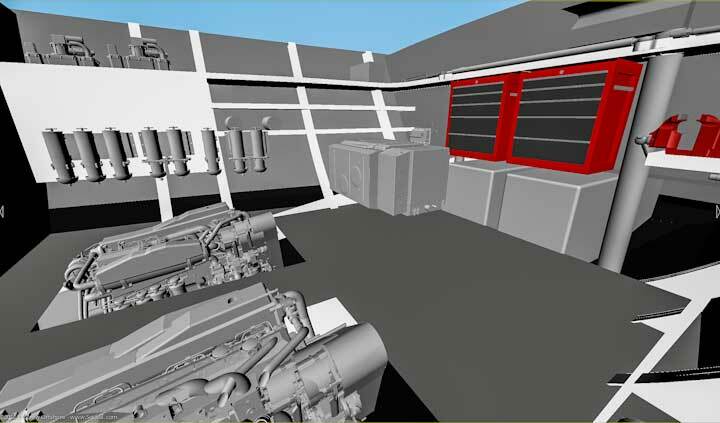 What you see here is the preliminary layout for the engine room. 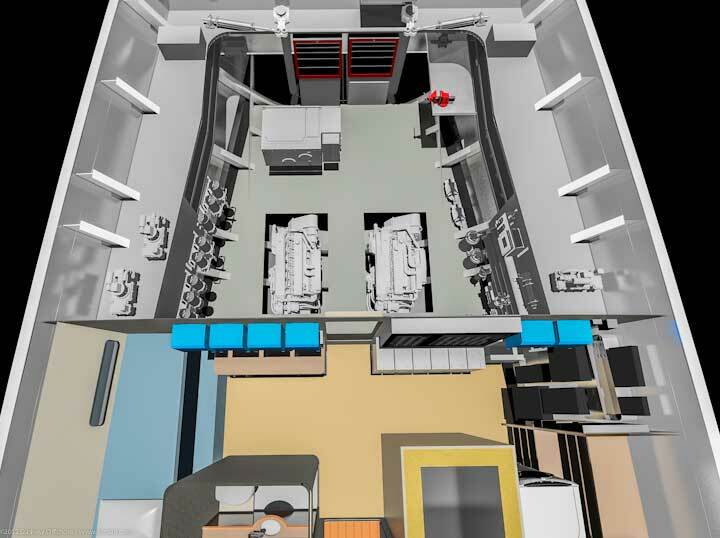 These renderings are done with a wide angle lens, so there is a bit of distortion. 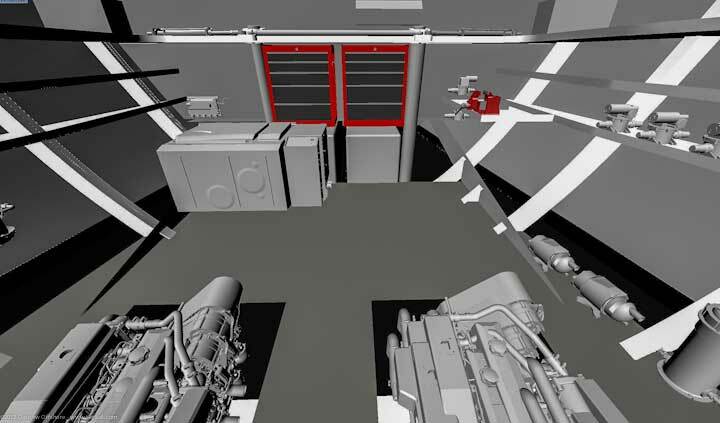 The goal is to get a view of the engine room as a whole. We do this now to determine what the challenges are, so that these are resolved before aluminum plate starts being fed into the plasma cutter. a work bench, sink, and two large tool chests. Equally important is the systems room just forward. Here live batteries, inverters, transformers, switch panels, fuses, and electronics black boxes. All easily accessed. Got a problem with a piece of electronics? This is where you start. 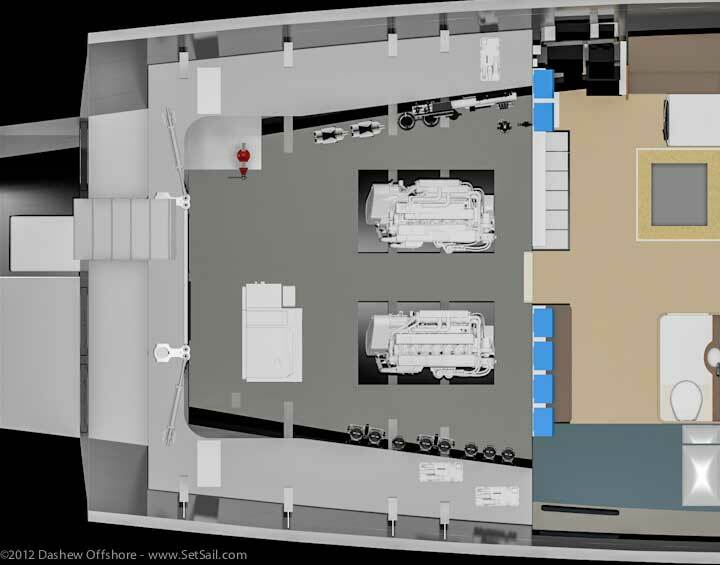 Here is an example of where 3D layout and real world experience converge. 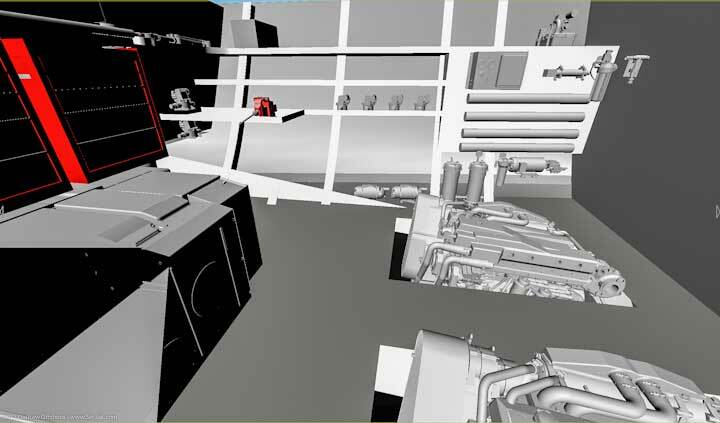 It is evident from the renderings that hull side and bulkhead contain enough space for each of the black boxes. But they are too close for wiring and working on them. So everyone is now aware we need more space. That space may be taken from the storage shelves forward or these may end up on sliding panels. 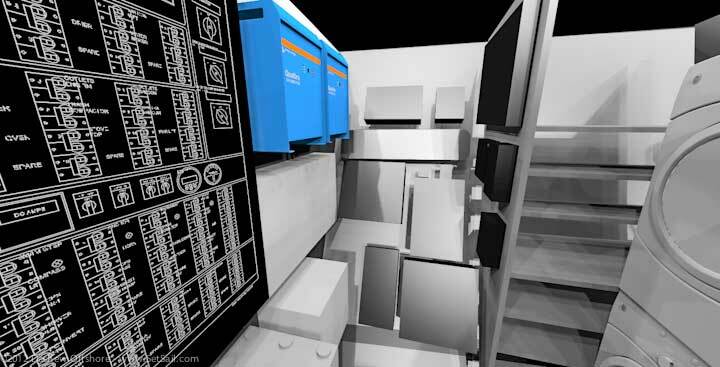 It will be many months before these areas are detailed in real life, and the final layout could look different. What we’ve done here is prove that the space is available. This entry was posted on Monday, March 5th, 2012 at 12:20 am and is filed under Dashew Logs, Wicked FPB 97. Both comments and pings are currently closed. I’d love to see you do a 55′ design for mass production. Offer it to someone like Bill Kimley of Seahorse Marine (http://www.seahorseyachts.com/) to build and your great grandchildren will still collect royalties. Maybe at some point in the future. Right now, we have our hands full. Have been visiting here regularly since the initial birth of the first FPB. Your solutions still impress me. The “Wicked One” may be your best design yet. Much more centralized systems than the 64, less clutter. Smart move. – Did not find the sink :), but was glad to see that you kept the stern outside lockers for fuel, trash, scuba etc. – Regarding battery bank: Would like to see a double set of banks for redundancy. Easier to balance, and a failure in one cell will not set you short on voltage.
? Will this one have holding tanks for grey water? No HeadHunter system as on the 115? – Getting to the shot-off valve for the SB exhaust must be tight with the generator back there. Thanks for making the effort to bring all this to us. We have looked at the one vs two banks of house batteries many times. 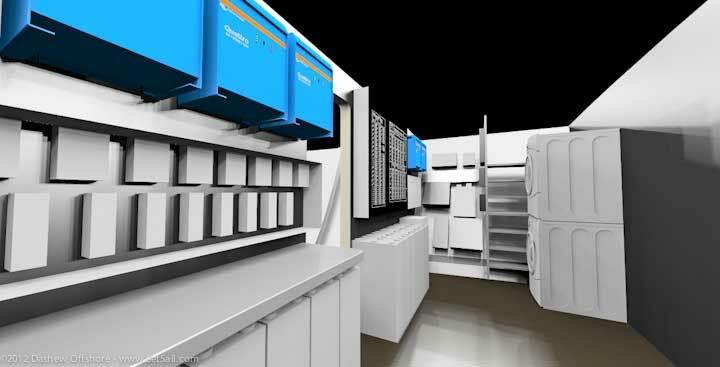 It is so much more efficient to have a single large bank, and should a cell die, which has yet to occur, we still h ave t he separate engine/genset start batteries. And now, with the FPB 97, the solar array to back up the batteries. There are gray and black water systems, and we have gone back to VacuFlush heads. 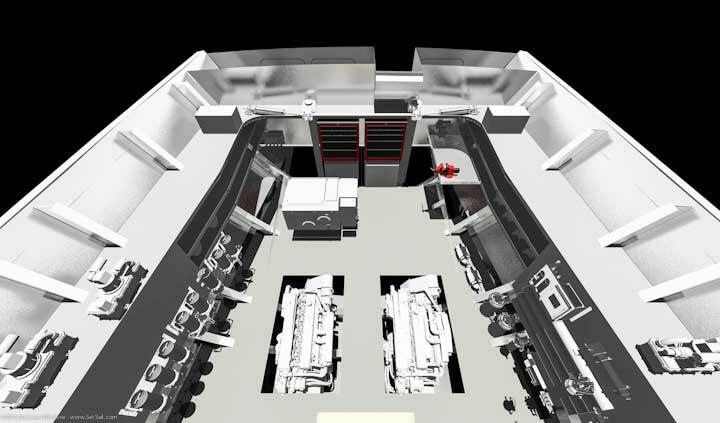 There is actually a lot of easily accessed space under the swim step, so engine exhaust valves will not be a problem. I see V drive like on FPB 64, 2 day tank and fuel filter and pump, oil change system, water maker, air-conditioning or fridge/freezer aggregate, generator, two unidentified boxes under the tooling box. But I don’t see the Kabola or whatever replaces them in the function of heating the boat at anchor? Are they the 2 unidentified boxes, or one of them? If you move the cloth wash/dryer in great room, you make it easier for install all the black boxes. The Kabola is not yet shown. Those are black water tanks under the swim step. The washer drier could go in the Great Room. Where it is shown is the worst case scenario systems wise. What are the length and the width of the 2V battery cells? I’ve recently found myself reading some interesting claims online about the advantages of utilizing carbon fiber props. Have you considered this or are the claims mostly bogus? The advantage of a semi-variable pitch prop seems advantageous, even on a displacement cruiser that isn’t really achieving high speeds. Obviously hull speed would be your limiting variable, but the claims of reduced engine loads, reduced fuel burn, and higher cruising speeds seems too good to be true, or is it? Reduced weight of the props certainly can’t hurt response when trying to get those suckers spinning, as well as reduced loads on cutlass bearings and all other associated parts. The ability to repair the prop on the go would help when cruising in remote locations. Quieter and smoother as well (of course neither of these are an issue with your isolated aft engine rooms). Costs are obviously high, but it would seem that Circa/Dashew could order a batch of them at a time reducing the unit cost of the prop. Advantages for the 64, 78, and 97s possible? I’m by no means an expert and only have the information provided by the manufacturers to go off of, so I was interested in what your take would be on this. No idea about carbon fiber props. However, our main concern is chopping wood and batting rocks when aground, so nibral bronze is probably a better idea. Also, you can repitch the metal props. But if anyone has real world experience with these props please inform us all. Another quick question… Have you considered utilizing something like SCS’s enclosed shaft system? It seems to tout advantages that could be beneficial for the FPB series as well (reduced noise and vibration, increased efficiency, decreased fuel burn, easier installation, and reductions in damage from groundings). We have looked at many shaft systems over the years. However, our power requirements are so small that the incremental increases make it hard to justify this type of system. Add a zero to our power burn and the answer might be different. The other issue is damage tolerance. We look first to what it takes to improve the damage tolerance of the drive line – think ice, chopping wood, chipping rocks (this must be the week for prop/drive line questions). This leads to oversize prop shafts and related support structure. The latter can be a hit on prop performance, so we try and feather the skegs to a fine edge and minimize the bulge of the shaft tube outside the skeg at the end. This would be more difficult with the extra diameter required by the type of systems which you mention.